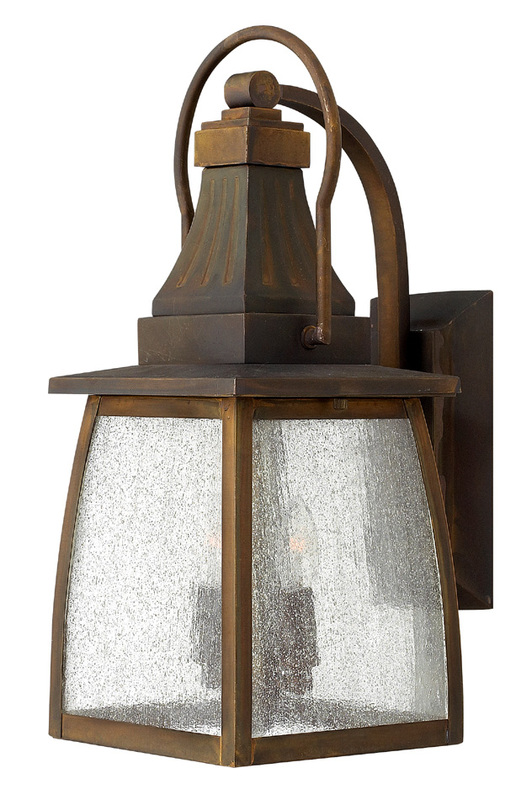 The Hinkley Montauk solid brass 2 light medium outdoor wall lantern with seeded glass and rated IP23 features the finest elements of traditional American East Coast style. The entire collection is made from Sienna bronze finish solid brass, complemented by clear seedy glass and candelabra style lights. Rectangular bevelled edge wall mount, with curved over arching arm and ribbed tapered roof lantern featuring a top stirrup. The four sided lantern has seeded clear glass panels and hanging mini candelabra inside that complete this classy design. Exterior fittings must have an IP (Ingress Protection) rating which indicates the fittings ability to prevent solids and liquids penetrating the enclosure. The higher the number, the greater the protection. The minimum rating for an outside light exposed to the weather is IP23. This outdoor porch lantern is rated IP23. Part of the Montauk outdoor lighting range, a quality solid brass medium outdoor wall lantern with seeded glass and limited lifetime warranty. There are matching fittings in the Montauk collection; please see below. This exterior light is supplied by Elstead Lighting and designed in the USA by Hinkley Lighting, founded in 1922 in Cleveland, Ohio. They have transformed from a small outdoor lantern company to a global brand intent on bringing you the best in style, quality and value, such as the Montauk solid brass 2 light medium outdoor wall lantern with seeded glass and rated IP23 you see here.